NASA tweeted that, "to stay on schedule with @Space_Station upgrades, it’s safer & faster to change spacewalker assignments than reconfigure spacesuits"
NASA astronauts Christina Koch (center), Nick Hague (left) and Anne McClain are seen aboard the International Space Station in this Friday, March 22, photo, before Hague and McClain went on a spacewalk, the first in their careers. The first all-female spacewalk, which NASA had scheduled for Friday, has been called off "due in part to spacesuit availability on the station," the agency said Monday. That issue involves the upper part of the spacesuit, called the hard upper torso, which connects to the helmet and arms. There was only one hard upper torso in a medium size that could be ready by Friday, NASA said in a news release, and astronaut Anne McClain found on a spacewalk last week that it fit her best. That meant McClain and fellow American Christina Koch couldn't participate in the spacewalk together. NASA didn't say in the news release what other factors might have contributed to the schedule change, or when the first all-female spacewalk would be rescheduled for. But after a cavalcade of ridicule on Twitter from people who said NASA should have more suits that fit its female astronauts, the agency acknowledged the criticism. It noted in its own tweet that there is a second medium-sized spacesuit torso aboard the space station, "but to stay on schedule with @Space_Station upgrades, it’s safer & faster to change spacewalker assignments than reconfigure spacesuits." 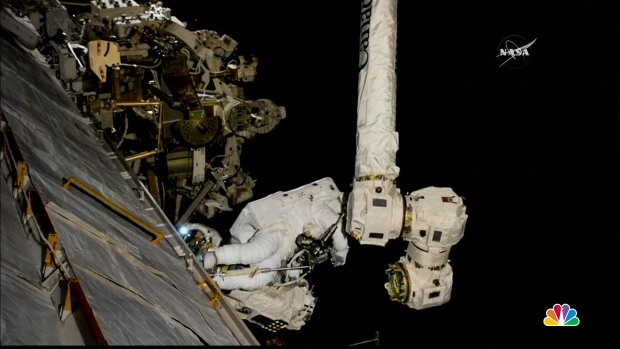 Two NASA astronauts ventured outside the International Space Station to repair a robotic arm. It is the first of three spacewalks planned for October. A NASA spokeswoman had told The New York Times, "When you have the option of just switching the people, the mission becomes more important than a cool milestone." Last week, NASA's spacewalk flight director, Mary Lawrence, previewed the series of spacewalks the astronauts are embarking on. She said that, while the astronauts are fitted for their suits on Earth, they are checked again in space. "Of course, your body changes slightly in space due to fluid shifts or spine elongation, so we do refit suits to the crew members and make sure that they have the optimal fit," Lawrence said. Asked about what being part of the first all-female spacewalk would mean to her, Lawrence noted that the spacewalk assignments might change, but added, "If they [the astronauts] can inspire that next generation of space explorers, they are certainly worthy of that inspiration and I am just proud to be a part of it." Both McClain and Koch are still slated to take part in upcoming spacewalks: Koch on Friday, to continue installing batteries for a solar array, and McClain tentatively on April 8.